There are uncountable benefits to sharing our lives and homes with pets. However, as any cat-owner can confirm, there are sometimes a few negatives. Just by following their normal, instinctual behavior, cats can sometimes create messes in our homes. Unfortunately, this can result in hard feelings between us and our feline friends. One common area of contention is the scratching of furniture, carpeting, or other household objects. When the normal cat behavior of scratching objects clashes with the normal human interest in keeping a nice home, cats often receive some of the following negative consequence. Some people try punishment for the scratching behavior. This rarely works and can cause your cat fear and pain. This usually results in more negative behavior. Some cats are released to fend for themselves outdoors, where they are exposed to disease, injury, and often early death. Some cats are declawed. An extremely painful process for the cat that can also change behavior and character, a cat declaw is the amputation of all 10 front digits up to the first joint. Other cats are surrendered to shelters where they may be euthanized if they aren't adopted in a timely manner. Why Do Cats Scratch Things in the First Place? In order to peacefully cohabitate with our cats, it's necessary to understand why they may engage in what we consider to be a negative activity and then provide them with an alternative that is acceptable to us and our furniture. Cats are born with the instinct to scratch objects for a variety of reasons. Cats have scent glands in their paws. Scratching deposits the cat's scent onto an object and leaves a territorial message for other cats. Likewise, the visual marks left on objects by scratching convey territory information to others. Scratching helps remove the outer layer from a cat's nails: it's good grooming behavior. Cats scratch to stretch their claws, feet, and bodies. This releases "feel-good" hormones that help keep your cat healthy. Cats scratch to release stress or excitement or "blow off steam." 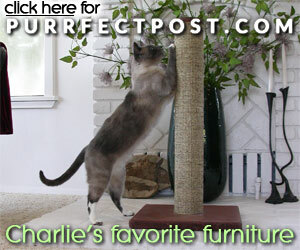 How Can I Deal With My Cat Scratching My Furniture? Fortunately, there are ways that your cat's need to scratch can be satisfied without sacrificing your household items. 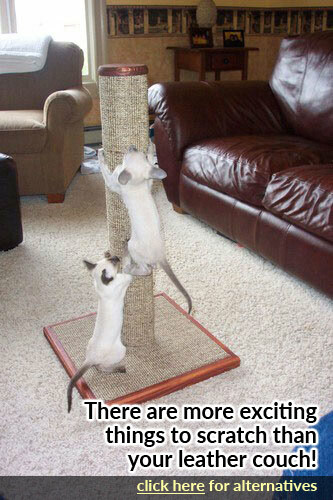 A great way to do this is by providing high-quality scratching posts. With some attention to the properties consistent with a perfect scratching place (height, sturdiness, and good scratching material), a little training for your cat, and some extra understanding and patience, your cat will certainly learn to leave your furniture alone. In fact, your friend will LOVE the posts. Indulging in their natural activities will allow your cat to be healthier and much happier, and that will result in more love shared with you, too!